In the middle of the storm and facing calls to resign, Brenda Snipes said she may retire when the Senate and governor recounts are done. LAUDERHILL, Fla. — Brenda Snipes, the embattled supervisor of elections in Broward County, hit back at criticism from President Donald Trump Tuesday while also suggesting she may step down from the office after the ongoing statewide recounts. Trump and other GOP officials have hurled unsubstantiated allegations of voter fraud at Snipes, with the president earlier Tuesday tweeting that the "characters" running elections in Broward and Palm Beach counties were trying to "find" new votes for Democratic Sen. Bill Nelson, who trails Republican Rick Scott, in the Senate contest. Snipes told reporters, "I don't have a treasure trove for going out digging on the beach or somewhere to find any votes." 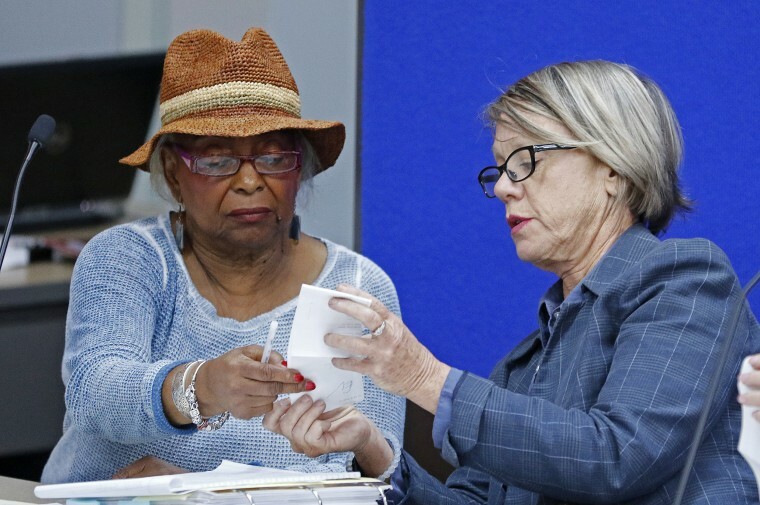 Snipes, who has been at the center of controversy over her handling of the close Senate and governor's contests, insisted the heavily Democratic county will complete its recount by the Thursday deadline, despite several delays. "There’s never been a deadline that we have missed," Snipes told reporters. And Snipes, who is African-American, noted that her office has faced more scrutiny than others, even though Broward is not the only place in Florida with election issues. "It’s sort of hard to rule out race, but I won't say, 'Oh, I'm a black woman and that's why.' I'm not saying that," she said. Snipes has defiantly weathered plenty of criticism in her 15 years on the job, but suggested she may not be long for it — even though she just won reelection to another four-year term in 2016. "It is time to move on, to let someone else," she said. "I think I have served the purpose that I came her for." Asked to clarify if that meant she would resign or not run for reelection, Snipes said she would complete the recount and then figure out her next move. "I haven't finalized that. I’ll just check with my family — they’ll tell me what I’m doing," she said. When county elections officials start drawing national attention, it's generally because something has gone very wrong. That's the situation for Snipes, who has faced angry protests outside her office from Trump supporters baring signs demanding her imprisonment. It's not the first time Snipes has found herself at the center of controversy or faced accusations of incompetence and wrongdoing, but the stakes have never been so high. Snipes spent most of her career as a public school teacher and principal and only got into election administration after her the previous officeholder was ousted following a botched 2002 gubernatorial primary, which followed the disastrous 2000 presidential recount. Snipes was appointed to clean up the county's election system in 2003 by a Republican, former Gov. Jeb Bush, who was sensitive to the politics of removing her black Democratic predecessor in the heavily Democratic county. Snipes went on to win reelection four times, including most recently in 2016, always by wide margins. Now, Bush has now joined other Republicans in calling for Snipes' removal from office, saying on Twitter that she "failed to comply with Florida law on multiple counts, undermining Floridians' confidence in our electoral process." Bush is hardly alone in his criticism, and it's not just coming from Republicans. Florida media outlets have uncovered numerous election administration issues over many years and the editorial board of the Sun Sentinel, the largest newspaper in Broward County, called on her to resign. Sen. Marco Rubio, R-Fla., told Politico that Broward County is "not just the most troubled elections office in the state, it's the most troubled elections office in the nation." Even some Democrats here say privately that while they admire Snipes' decades of dedication to her community, her competence at the nitty gritty work of election administration leaves something to be desired. A Democrat even ran against her in a primary 2016, citing her office's past issues, but he lost badly. A judge earlier this year ruled that Snipes' office had broken the law by not preserving ballots as long as they were required following the 2016 election. That year, her office left a referendum on medical marijuana off some ballots. And before that, it accidentally posted the results of the presidential primary before polls closed — a big no no since early returns becoming public can influence voters who have yet to cast their ballots. And in 2012, nearly 1,000 uncounted ballots were discovered a week after the election. "Unfortunately, this is not the first time this has happened in Broward," Broward County Commissioner Ilene Lieberman said at the time. During this year's recount, Snipes has been criticized for not giving up-to-date information on how many ballots remain uncounted and for processing 22 voided ballots that were accidentally mixed in with valid ones. But most critically for the recount, a poorly designed ballot has put Snipes' office at the center of the recount controversy. Nelson's only hope to make up his roughly 12,500-vote deficit behind Scott could rest with that ballot, which Democrats' hope was misread by machines on election night. Add to that the fact that Broward is one of Florida’s most populous and most heavily Democratic counties, and it's easy to see why Republicans have focused so much attention on Snipes. Still, their most explosive claims against her have fizzled. For instance, empty boxes that some on social media said contained uncounted ballots turned out to hold nothing but supplies like clipboards and "Vote Here" signs. A Broward County judge on Monday reiterated that he had seen no evidence of voter fraud, as Trump and others had claimed, asking attorneys to present some evidence before continuing their rhetoric about it. And Snipes has plenty of defenders, as evident by her easy victories. "She's a woman full of integrity, and I'm sure that's why Jeb Bush appointed her," said Grace Carrington, a Democratic Committee National committeewoman who knows her. "He's a Republican, so if he didn't have confidence in her, I don’t believe he would have done that."